COCOA BEACH, Florida -- It is that time of year again when sand fleas gather in colonies for mating season. 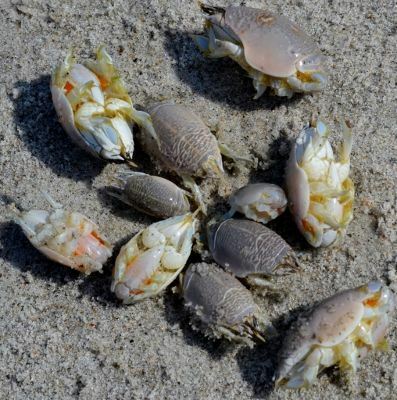 Sand fleas (also known as mole crabs) are perfect bait for surf fishing for red fish, black drum, pompano, and sheepshead. Sand flea colonies can be found all along Brevard County beaches this month. They are easiest to find as the high tide is coming in and the crustaceans scramble to find new real estate to bury themselves in wet sand between the ebb and flow of the waves on shore. The incoming tide makes the wet sand slushy which helps with the ease of digging up the sand fleas. The timing of the sand fleas could not be better because, along with the free bait, this coming Friday is a Full Moon. Due to the hot summer days in June, be sure to refresh your bait bucket with cooler ocean water to keep the sand fleas cool and alive after you have caught them.